The picturesque Yorkshire Dales look even better from the seat of Bristol L or Bristol MW. 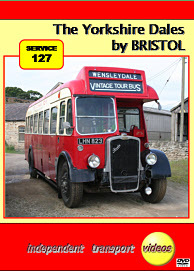 Come and join us on this trip down memory lane on board two of these fine Bristol vehicles. Vintage Omnibus Services based near West Tanfield in the Yorkshire Dales operate service 127 from Ripon to Garsdale via Hawes. During early June in 2009 the independent transport videos cameras were invited to film one of the Tuesday journeys. We travelled on ex. United A. S. BG381 (LHN 823) a Bristol L5G with ECW B35R body built in 1949 and ex. Eastern National 1348 (208 YVX) a Bristol MW5G with ECW B45F bodywork. After a visit to the depot to see their other L5G, former Lincolnshire R.C.C. 749 (FFW 830) also with an ECW B35R body, we set off to Ripon to take up service 127 on the long journey to Garsdale via the pretty town of Hawes. There is plenty of action, the sound of the Gardner 5 cylinder engine is music to the ears, coupled with the superb scenery passing the windows you are certainly in for a treat. We film from both vehicles to complete the atmospheric experience. There are plenty of outside shots as well to see the vehicles in this beautiful environment which was home to these types of buses from the late 1940’s to the 1970’s. We also visit the Wensleydale Railway on one of the stops at Redmire Station. From Garsdale we return to Ripon and back to the depot. Sid Parker, our conductor for the day is also an artist, so we feature some of his work as a bonus at the end of this programme. Enjoy your ride!